In 1990 jeweler Soraida Salwala watched a news report featuring two Asian elephants that had fallen from a cliff in Kwia National Park. One had died. The other was injured. 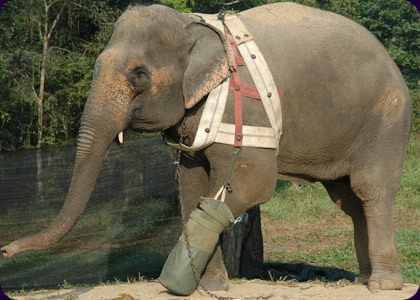 A member of a wildlife foundation, Soraida phoned a call-in number to insure the elephant would be rescued. When she was told it would not, she realized that her status as a supporter of an organization was little leverage in her efforts to help save an endangered species. Years later Soraida opened the world's first elephant hospital, and today leads campaigns against the government for their involvement in elephant trafficking. Michelle Mizner grew up in Central California and received a full scholarship to study cinema and creative writing at Cal State Northridge. During film school, Michelle directed many short films, slaved at a few big production companies, took as many anthropology and public health classes as she could manage, and surfed. After film school, she moved to Boston to work with an intergenerational literacy program and make a documentary about domesticated elephants in Thailand. Currently, she works at a medical clinic in a homeless shelter. Dr. Donald Tayloe practices internal medicine in Fresno, California.